Same day connection. Instant approval. No deposit. 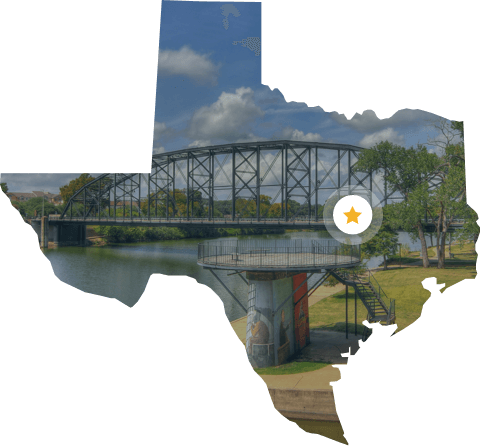 Located along the Brazos River, the city of Waco lies south of Dallas. Known as one of Texas’ mid-size cities, it has roughly one-hundred and forty thousand residents. It’s history is marked with growth and industrialization that spans from the Civil War through to World War II. Due to it’s place within a deregulated Waco electricity market, its residents are able to select an energy provider from the numerous service companies within the state. With a rich history, vibrant community and employment and entertainment options – proud home to Baylor University – the city has unique needs and challenges when it comes to Waco electricity and its residents need a reliable and trusted resource that they can turn to for affordable Waco electricity. When it comes to Waco electricity consumption, the average monthly kilowatt-hours used by citizens is just over 1,170. In comparison to the national average, residents use over 200 kWh more of energy each month than others. Even with increased usage, the average bill for the city manages to match the US average of roughly $112. And because residents are able to select from a number of energy companies, they can play a part in keeping their costs low. Payless Power provides the best prepaid and standard energy plans with no cancelation fees and no deposit in the area. Since 2005, Payless Power has been helping people get a better energy rate and save on their average bill, regardless of income or credit history. As a family-owned business, and not a giant electric company in Texas, we take great pride in serving our customers with care and respect across the entire state. *Save 20% off Payless Power’s standard rates with the Flex Pay discount. For details, please read the Electricity Facts Label. Been a loyal customer with Payless Power since 2014. Customer Service reps are always very friendly and soooo helpful (except for only one time, I got one that thought she owned the place….). They want to help you not just take your money, and if you are in a bind with your electricity, they will help you and not make you feel like a bum…. This has been the easiest company to work with for electricity. I was worried about being able to get service due to past credit problems. I love the daily texts which help me monitor use and my balance. The price is more than affordable and I couldn’t be more pleased with the service. Payless Power wants to be your Texas electric company.